The leading American jewelry firm, founded in New York City in 1837 by Charles Lewis Tiffany (1812-1902) with John B. Young, the firm then selling miscellaneous inexpensive wares, but soon thereafter expanding to offer jewelry, diamonds, and watches. In 1841 J. L. Ellis became a partner, and Tiffany and Young travelled in Europe, buying large and important collections of jewelry. 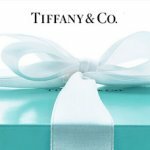 In 1853 Tiffany acquired the entire firm, thence known as Tiffany & Co. In 1850 it introduced the English Sterling Silver standard which later was legalized for American Sterling silverware. In 1868 it merged with Edward C. Moore & Co., silversmiths; Moore, who had been a Tiffany designer since 1851, influenced the introduction of Japanese styles. In 1886 Tiffany introduced the Tiffany setting for diamond solitaire, introduced c. 1892 his Favrile iridescent glassware, and c. 1900 joined the firm. In 1940 the firm, having acquired an international reputation for jewelry, gemstones, and silverware, moved to its present luxurious premises at 5th Ave. and 57th St. Walter Hoving, who in 1955 assumed control from the Tiffany and Moore families, has retired. Henry B. Platt (the great-great-grandson of Charles Tiffany), now Chairman of the Board, was responsible for the discovery and naming of Tanzanite in 1968. Branches of the firm are in several American cities, as well as in Paris (since 1850) and London (since 1868).